Watch as Ray Cover guides you through the steps necessary to complete some of the most beautiful art-work in the world today. 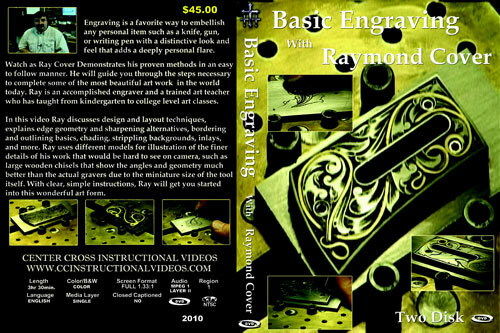 Ray is an accomplished engraver and a trained art teacher who has taught from kindergarten to college level art classes. He discusses design and layout techniques, explains edge geometry and sharpening alternatives, bordering and outlining basics, shading, stippling backgrounds, inlays, and more. Ray uses different models for illustration of the finer details of his work that would be hard to see on camera, such as large wooden chisels that show the angles and geometry much better than the actual gravers due to the miniature size of the tool itself.